Collections by Weiser offers five handlesets to choose from. These handlesets offer solid forged brass construction and Grade 1 cylinders for uncompromised security. The bold form and clean, geometric shape of the Vedani lever reflect a contemporary aesthetic. Both knobs/levers can be locked or unlocked by key on the outside, or turn button on the inside. The Polished Chrome is perfect for coordinating in a bathroom with polished chrome fixtures. With this Electronic Camelot Handle Set paired with an Accent lever in Aged Bronze you don't have to worry anymore about hiding keys under the doormat. No more losing, forgetting, or making extras keys time and time again. Step up to a more secure and flexible solution with Schlage electronic security products. Youre free to add, change, or delete user codes in just seconds and to come and go as you please. 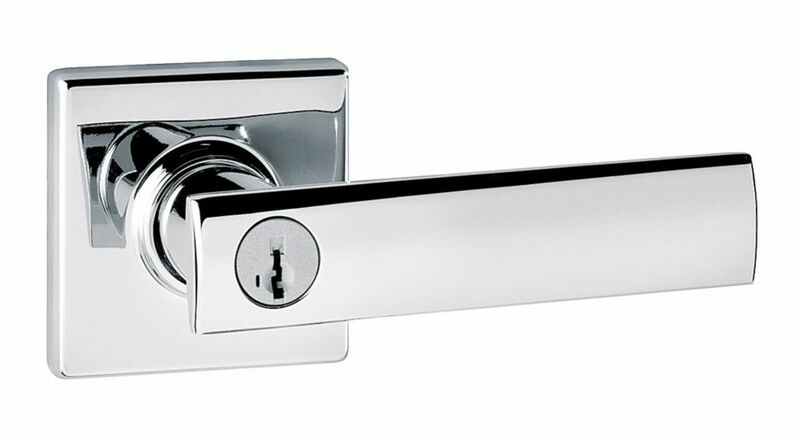 Vedani Polished Chrome Entry Lever Collections by Weiser offers five handlesets to choose from. These handlesets offer solid forged brass construction and Grade 1 cylinders for uncompromised security. The bold form and clean, geometric shape of the Vedani lever reflect a contemporary aesthetic. Both knobs/levers can be locked or unlocked by key on the outside, or turn button on the inside. The Polished Chrome is perfect for coordinating in a bathroom with polished chrome fixtures. Vedani Polished Chrome Entry Lever is rated 5.0 out of 5 by 1. Rated 5 out of 5 by Law20 from Great product I bought this in a month ago and since it was installed, I’ve had no issue, the chrome shade is amazing. The lock handle is solid and protect my doors very well. I got three of these for my entry doors with the matching deal bolts .i will recommend this product.